I have been trying my hand at panorama pictures lately - taking multiple overlapping shots and then stitching them together. My first attempts came out quite well. My later attempts highlighted some shortcomings with stitching software. 360 degree panorama in a park we went to for Mother's Day. This definitely came out well, even though I was just holding the camera and turning in spot. A smaller view cropped from the panoramic view. 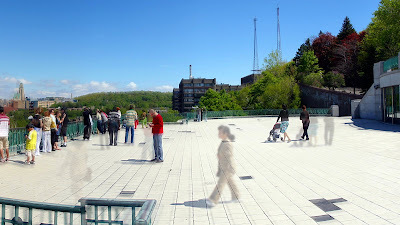 Part of a panoramic shot taken at St. Joseph's Oratory in Montreal. Subject matter which moves between shots end up looking like ghosts. 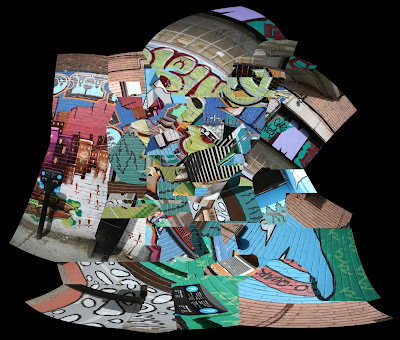 I tried to capture a wall of graffiti by taking multiple shots and sliding horizontally between shots. Unfortunately, it seems the stitching software expects the camera to remain in a fixed position and not to be moving. As you can see, it did not stitch it together correctly. The red door on the left is in the wrong place and if you look to the right side, the automated parking ticket dispenser is partly ghosted on its left side. I tried to stitch the image together in smaller batches (this image is comprised of 63 separate images), but was not successful. I then tried a different photo stitching software. And the result below shows that it was not quite so successful either. I primarily use AutoStitch to do the stitching. It is pretty simple, just load a bunch of pictures and it does the rest. By default, it generates a panorama with a maximum width of 1400 pixels. You can go to the options menu and change it to be 100%. The application has run out of memory trying to stitch together some of the larger panoramas. For the last panorama, I tried hugin. This one is not so automatic. It does have some automated tools for matching up and lining up the images (not part of the standard download) and I was not able to get them to work (the just abruptly terminated). So I was forced to identify anchor points among the various images. I only did one of two per pair of images; this may explain why it came out so garbled. The recommended number is 10 or more per image pair. those are fantastic shots richard. i especially like the graffiti. Oh, these turned out incredible. As with Ingrid, my favorite is the graffiti. The first one did turn out great and has nice perspective. I also like how the ghost effect in that one shot, too. Thanks for the link on Autostitch. I'm very curious about the process. I'll have to check that out. ingrid: thanks. I thought of you when I shot the graffiti since I know of your affection for it. My interest in graffiti tends to be in the seeming universality of the style of font used. Perhaps the medium dictates the style, or perhaps there is a universal "graffiti" font. breal: thanks. I didn't know you liked graffiti as well. The panorama were the "ghosts" show up was not that interesting, however, however, cropping out the ghostly image turned out quite well. Sadly, I was not able to duplicate it as well this afternoon with some shots I had taken earlier today. AutoStitch works quite well, however, more experimenting today shows me that it really expects all the images to be shot from a single point. It does transformations on the images to make them fit correctly. As mentioned, with the graffiti shot, I slowly slid along the who of the image to capture it. Unfortunately, this seemed to confuse AutoStich which expects all the images to be taken from a single point. I have some interesting perspective warping results from AutiStitch when I tried to piece it together in smaller batches. aka r'acquel: yeah, I am still playing around with panoramic shots. Some come out better than others. It seems to work best for, well, panoramas, rather than trying to stitch together multi-megapixel pictures. I saw that link from your site a while back. I should try that with my kids too. I just LOVE the ghost effect, I could frame that photo and hang it above my desk! carra: go for it! I would be really honoured. I can send you the orignal sized one. It is 3211x1808 pixels instead of 1600x901 on blogger.